I'm sure most of you looking at this page are already fans of the Eveningstar Cinema in Brunswick and are aware of its past struggles to stay open. Today we face a new issue. The current owner is selling the Eveningstar as his health has declined and running it has become a bit too much for him. 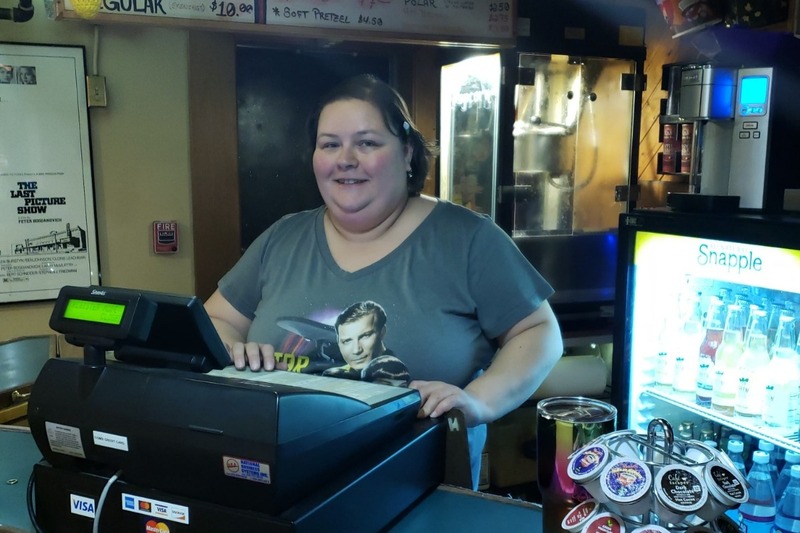 The Manager, Gracia Babbidge, has been attempting to find a way to get a loan in order to buy the theater and keep it running as smoothly as possible. This has proved to be quite a challenge, so that's why we're starting this campaign. Gracia has worked in cinema for over two decades, including at a few multiplexes, prior to changing her first reel at the Eveningstar 15 years ago today, April 11th, and "knows cinema operations top to bottom", as she often likes to say. Having worked there longer than nearly anyone else has, she knows the ins and outs of the Eveningstar like nobody else, and most importantly you all know her. She sells many of you tickets and concessions, sometimes weekly, with a smile, the occasional wise-crack, and sometimes with a crochet work-in-progress nearby! Our goal here is to secure the funds to purchase the cinema from the current owner, to ensure that the Eveningstar can keep presenting quality movies, and being the specialty cinema you know and love. 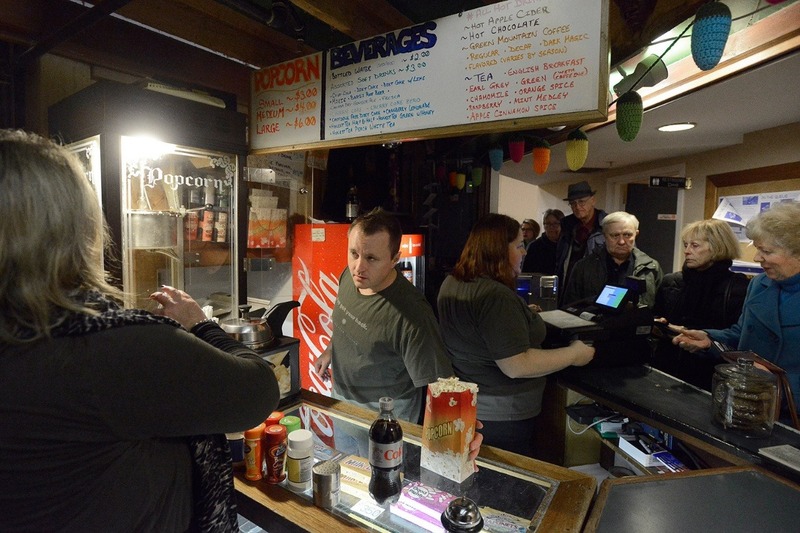 We know that the little details - such as having real butter available for the fresh popcorn, couches for cozy seating - are what we can keep doing to keep the "special" in 'specialty cinema'. Please consider making a donation, sharing the link on your social media, and telling your friends what we are trying to do here. With your help, the cinema can changeover to someone who has the knowledge, and the wish, to keep it running like the hidden treasure it is. Note: If we are unable to reach the minimum amount needed to ensure we can purchase the theater from Barry, we will be contacting GoFundMe and having them refund everyone. The same goes for anyone who donates at the theater, we are keeping a ledger of who donates in person and will return any money received. 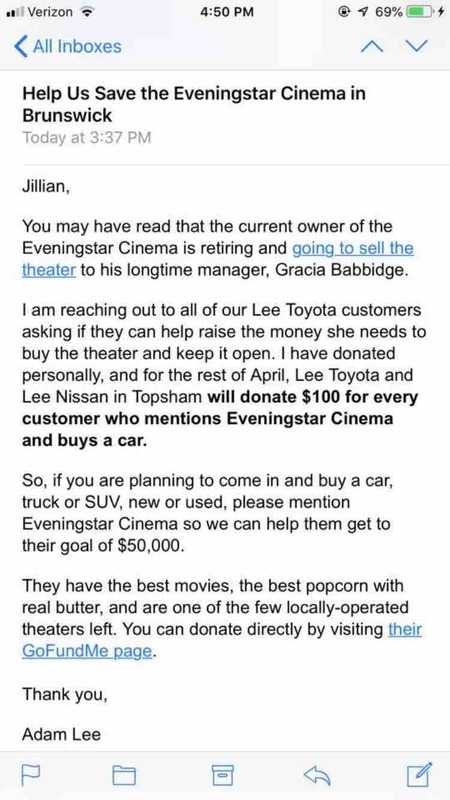 Major props to Lee Toyota! We’re grateful for the support! Just a quick update to say thank you to everyone that's been going out of their way to help us get word of the campaign out there. Because of some very kind members of the community Gracia was featured on the news this week, we made the times record, Bangor Daily News and the Press Herald as well as the local radio and several other sites. As it stands right now we are just shy of $8,000. I'm confident we can easily go above that today. So keep sharing, keep spreading the word, and keep your fingers crossed! We can do this! 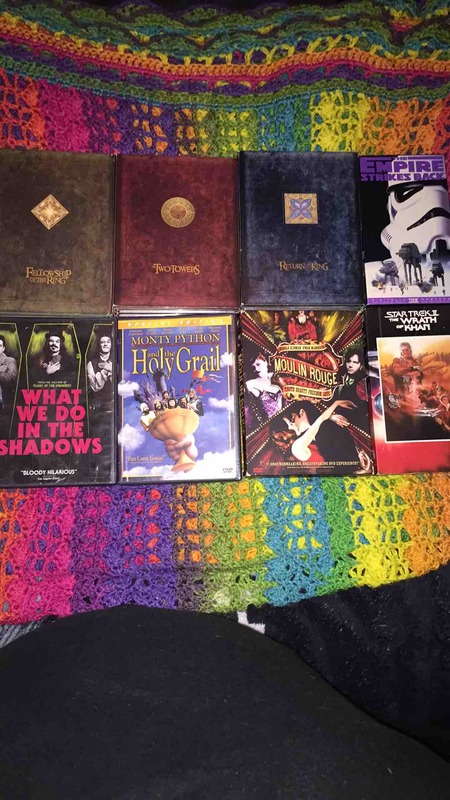 Picking just one “favorite movie” is pretty darn difficult. Pictured here are eight movies for which I have a lot of love, and have rewatched several times. Speaking of a lot of love - thank you for your support!